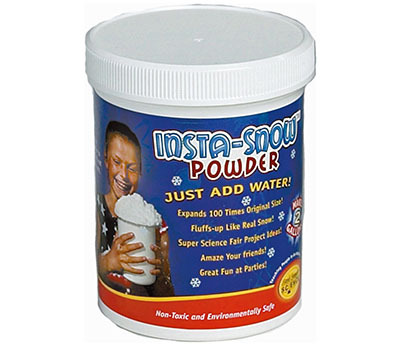 Insta-Snow Powder is a polymer that expands when mixed with water, and it’s generally well-liked. A tub of it holds 100 grams and it’s not very expensive. I’m linking it here because you’ll want to read this review of a woman in Arizona who bought 75 gallons’ worth of Insta-Snow Powder and covered her entire front yard in it, and then complained that it was hard to clean up.